A new book on the 1996 Seeds of Hope East Timor Ploughshares action commemorates the upcoming 20th anniversary of a landmark in peace movement history. 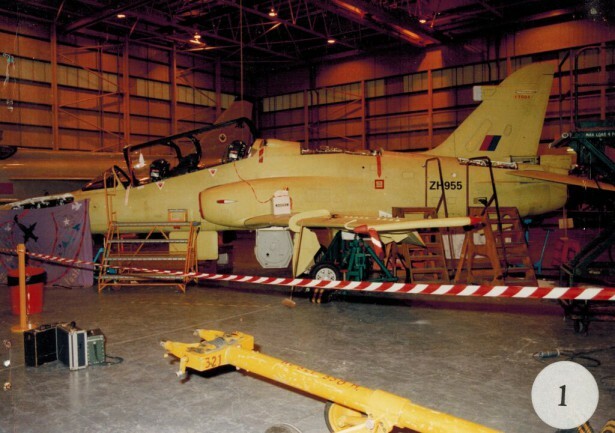 In January 1996, I was one of 10 women who carried out a Ploughshares action in England, disarming a Hawk attack aircraft at a British Aerospace factory in Lancashire. The Hawk was about to be delivered to the Indonesian military, for use against civilians in illegally occupied East Timor. The action – the Seeds of Hope East Timor Ploughshares – came after three years of campaigning to stop the sale by other means. Together with thousands of people all over the country, I had written letters, signed petitions, taken part in public meetings, rallies and marches and organized acts of civil disobedience. Nothing had worked, and the planes were about to be delivered. The only thing left to do was to disarm them ourselves. After our act of disarmament, we were arrested and charged with criminal damage – at that point put at the equivalent of $3.6 million. We were refused bail and held in prison for six months. In British law, you are allowed to use reasonable force to prevent crime: We argued that we had been using reasonable force to prevent the crime of genocide in East Timor. The jury listened carefully to the evidence about East Timor and how selling Hawks to Indonesia made Britain complicit in the genocide, and acquitted us of all charges. 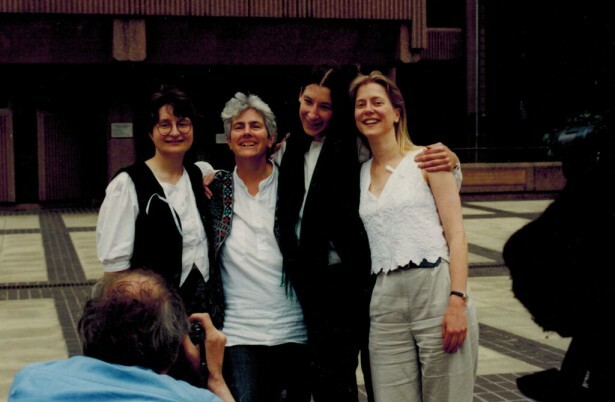 The acquittal was a landmark in peace movement history: It was the 56th Ploughshares action worldwide, but the first time that anyone had been found not guilty. The jury’s verdict showed that ordinary people, when presented with the facts, can see that extraordinary action is justified when one’s government is engaged in criminal behavior. To mark the 20th anniversary, I’m writing a book that tells the inside story of the action. Seeds of Hope happened when the Internet was in its infancy, and there’s very little written about it. 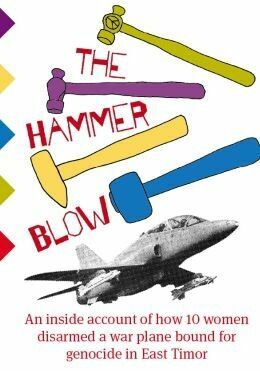 “The Hammer Blow” — to be published by Peace News Press, which is running a crowdfunding campaign until October 28 — will tell the full story from my point of view, including the year-long preparation, the action itself, the vital role of the support group, the prison time, trial and acquittal. Although the Seeds of Hope action took place almost two decades ago, it is still relevant today. Britain is the world’s second largest weapons dealer, selling arms to countries embroiled in conflicts and guilty of terrible human rights abuses. As refugees pour out of war zones in the Middle East, Britain’s response is to offer sanctuary to a very few, while continuing to see that area of the world as a key market for arms deals. Campaigners in every area — the arms trade, the environment, human rights — need to be prepared to stand up and hold governments to account. The Seeds of Hope action showed how a small group of committed women did just that. “The Hammer Blow” aims to inspire new generations of activists, and to show that, even when the cards appear stacked against us, we can still win. What follows is an excerpt of the book. For several weeks I had been having panic attacks. They would swoop on me out of nowhere; walking down the street, not even thinking about the action, my legs would suddenly turn to jelly, my heart would start pounding and great waves of panic would engulf me. I’d have to sit down and take some deep breaths to calm myself. These episodes made me worried about how I would cope on the night: If I could react like that beforehand, how much worse would it be in the actual event? But now, to my surprise, I felt very calm and focused. We’d spent nearly a year in planning, and had talked through every last detail of what we were to do, right down to the configuration in which we’d cut the fence and who would wield each tool as we broke into the hangar. I think we all needed reassurance that we could carry off this disarmament, and such detailed planning gave us a sense of security; there were to be, we hoped, no surprises. We finished the minute’s silence, gave each other a last hug, and headed for the fence. Lotta and I were carrying boltcutters, Jo had the Japanese peace cranes we’d made to tie on the fence as a symbol of our peaceful intentions. Lotta and I worked on cutting an arch-shaped hole in the fence, while Jo tied the peace cranes nearby, her frozen fingers struggling with the string. We were confident the fence wasn’t alarmed: Jo and I had made a small cut in it during one of our night time recces some weeks earlier, before giving it a vigorous shake and scuttling behind a bush to watch for any reaction. Nothing had happened. After the trial, a British Aerospace worker in a more unguarded moment told us that there was in fact a movement sensor on the site but it was set off so often by rabbits that it was generally ignored. Perhaps that night the security guards had been sitting in their office wondering vaguely about the three extremely large rabbits hopping around. It seemed to take ages to cut the fence; our hands were cold and we were made clumsy by the urgency of the situation. Finally the last strand gave way. I scrambled through the hole and grabbed the bags which Lotta and Jo passed to me before squeezing through themselves. From where we had entered, it was only about 50 yards to the nearest entrance, a fire door on the corner of the building. But to reach it we had to walk through chest-high grass, which was dry and frozen, and crunched and snapped as we passed. There was otherwise complete silence apart from the occasional distant engine, and the noise of the grass seemed incredibly loud. But nobody seemed to hear us, and soon we were clambering up the bank onto the road around the hangar. The fire door was right in front of us. We planned to smash the glass, then reach through and push the exit bar from the inside. Having no idea how strong the glass would be, we’d taken no chances and come equipped (“armed” as the prosecutor would later put it with no sense of irony) with an enormously heavy iron bar, a weight from inside a sash window. It had been ceremoniously presented to us a few weeks earlier by Ricarda and Rowan, support group friends who were replacing their windows. Not wanting it to appear to be an offensive weapon, they had carefully painted “Women disarming for life and justice” on it. It would later be brought out in court as evidence against us, the prosecutor grimacing slightly as he struggled to hold the huge lump of iron whilst reading the words to the jury. There was a camera over the fire door, and security lights on each corner of the hangar. Standing there in the glare of the lights I felt very exposed and vulnerable. Surely they must have noticed us? What if we were caught now? We’d talked a great deal about what we could do to make the action a success even if we didn’t manage to disarm the Hawks. To that end, we carried with us personal statements and a video we had made to leave at the site to explain what we had come to do. We even had business cards with our names and “Seeds of Hope East Timor Ploughshares” inscribed on them. Nobody would be left in any doubt as to what our intentions were. But despite all that, I knew that I’d be desperately disappointed if we failed to hammer on the planes. And more than any personal feelings, the fact was that we were trying to prevent these Hawks from leaving for Indonesia; it was absolutely vital that we were able to carry out the action as planned. In desperation, and expecting a heavy hand on our shoulders at any minute, we set to with the crowbars, but the gap between the two doors was too thin for them. Things weren’t looking good: It would be terrible to be caught now, so near and yet so far from our target. While Lotta and I wrestled with the door, Jo ran off round the corner to see if we could get in anywhere else. A couple of minutes later she was back. “I’ve found a way in,” she said. There were small doors set into the big folding metal shutters which opened to let the planes in and out of the hangar, but in our planning we’d dismissed these as being too difficult to crack. However, Jo had almost got one open with her crowbar; a little extra pressure from Lotta and me, and the whole lock popped off. We were in. Several hours later, we were being interviewed by detectives at Lytham police station. They were very keen to know how we’d got into what they’d obviously been told was a very high security area without being detected. “Come on, just tell us, it won’t do your case any harm,” they coaxed. I was tempted to tell them how easy it had been, how we’d more or less just walked right in, but I bit my tongue and smiled at them in what I hoped was a suitably enigmatic manner. They thought we’d had inside information or help; how else could three women have got into such a fortress? In fact, all the information we had was publicly available — at least to anyone willing to spend many days and nights sitting in freezing ditches peering through binoculars — and the lack of security was simply luck. The lights in the hangar were on low, bathing all the planes inside in an eerie green light. We were interested in only one of them: an Indonesian Hawk. By the time of the action, Jo and I were experts on how to identify Hawks. We’d spent hours browsing military aircraft magazines and planespotters’ guides. We knew how to tell a Hawk 60 from a Hawk 100 and a Hawk 100 from a Hawk 200. We knew which serial numbers had been allocated to the Indonesian order of 24 Hawks. British Aerospace were also making the planes for other countries, including Saudi Arabia, and while that regime committed plenty of its own human rights’ abuses, we needed to keep the issue very clear, and not hammer on the wrong planes. But there, standing right in front of us, was the apple green Hawk ground attack plane that Jo and I had seen being taken out of the hangar two days earlier. The lettering on its tail — ZH 955 — told us that it was destined for the Indonesian military, one of the world’s most brutal regimes. This was one of the actual weapons they planned to use to perpetrate murder in East Timor. I’d expected it to be much bigger. For so long it had loomed large in my imagination, filling my thoughts, screaming into my dreams, overwhelming me with its power and violence. And yet now that we were standing in front of it, the Hawk seemed so small, so vulnerable — so easy to disarm. By this time we’d been inside the site for about 10 minutes. We’d cut through a fence, smashed two panes of glass, and forced a door, all under the eye of security cameras. Discovery must be imminent: We had to work fast. I had a heavy lump hammer that I’d bought a few months earlier to chip mortar off old bricks when I was rebuilding a wall. I’d decorated it with the words from the biblical book of Isaiah that have inspired so many disarmament actions: “They shall beat their swords into ploughshares and their spears into pruning hooks.” On the handle I’d painted “Choose life!” a reference to another biblical line, from Deuteronomy: “I put before you life and death, blessing and curse. 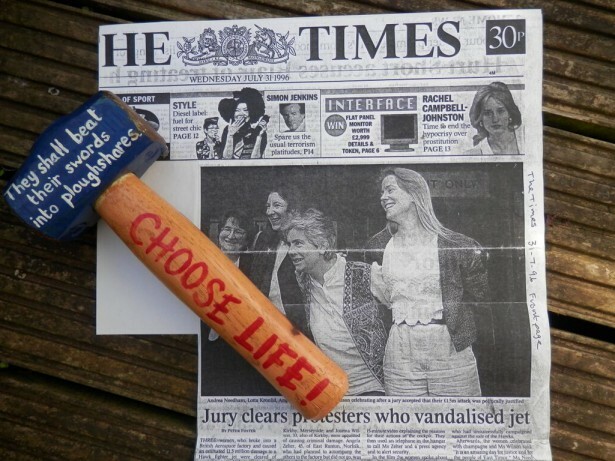 Therefore, choose life.” For me, this action was all about choosing life: Choosing to say yes to a disarmed world and no to weapons of destruction; to say yes to nonviolence and no to violence; to say yes to accountability for our actions and no to the abdication of responsibility shown by British Aerospace and the British government. Jo had a smaller hammer, which had been a gift from friends, and Lotta had two hammers, which had both been used in previous Ploughshares actions. One of the beautiful things about Ploughshares actions is that anyone can do them. You don’t need to be a technical genius or an engineer; you don’t need to be physically strong; you don’t need any expensive equipment or special skills. All you need is a hammer and a functioning arm. We each had both of those things. We started hammering. Andrea Needham first became involved in radical politics when living in Washington, D.C., in the late 1980s, first at the Community for Creative Non-Violence, and then at Dorothy Day Catholic Worker. In Britain, she has campaigned on issues including war and sanctions on Iraq, the arms trade and climate change. She lives in Hastings with her 11 year old daughter, and currently works on campaigns against roadbuilding and biofuels. Inspirational, brave and ingenious. You make me feel proud to be a woman. I am sickened by the British Government’s policy of supplying weapons that will be used on the poor, and on women and children. I am disgusted that they stand by and do nothing for the West Papuans who are systematically being wiped out by the Indonesians. I look forward to reading your book. I have been involved in the East Timor solidarity movement in Australia for 40 years and almost as long in the West Papua solidarity movement. Your 1996 action to disable the weapons computer of a Hawk Attack that was to be used to commit genocide against the East Timorese made world headlines. I want you to know that in the eyes of thousands of people around the world, the members of your group were considered to be heroes. Then when your case came to court, the jury’s decision gladdened the hearts of many who were fighting fot the human rights and the liberation of all the victims of the Indonesian military (TNI) – East Timorese, West Papuans, Indonesians and Achehnese. The TNI is a force for fascism in the SE Asian and SW pacific regions of the world and has far too much power in Indonesian politics. This is the main reason why Indonesia has been laid waste by the big corporations and why there is much corruption and brutality in in Indonesia. Later that year, I attended the Asia Pacific Conference on East Timor in Kuala Lumpur. It was attacked by thugs from the youth sections of Malaysia’s ruling parties. When the police came to sort out the problem, the participating delegates were all arrested and detained for nearly 2 days and then deported. The Malaysian organisers of the conference and a number of international journalists were imprisoned for a short time. This came about because the Indonesian dictatorship pressured the Malaysian government of the day. Thirteen years later, the Malaysian organisers sued the Malaysian government for the way they were treated and they won! Many in this region of the world view the TNI as the largest force for terrorism and fascism in our region. It has committed crimes every bit as bad as those committed by the Nazis. In the long run, more work must be done by us all to ensure that our governments stop assisting the TNI to continue its repression, to have it withdrawn from West Papua and Acheh , to bring all the war criminals in its ranks to justice and to compel the Indonesian Government to compensate all of its victims. It is good to hear more details of your 1996 action. Congratulations on your victory. It was a great morale boost to the East Timorese who suffered so much during the TNI occupation of their country. Right on Andy. TNI function as a parasite state in Republik Indonesia and as what my colleague in West Papua Bob Mitton called “bandit dictators” in his book Paridise Lost about Papua, published by his Monash University friends after his untimely death in ?1976. Kia ora from Aotearoa/NZ. I was a very young geologist employed by PT Kennecott Indonesia in 1971. And secretary of the NZ Campaign for Independent East Timor for a few months in 1977. Also in AWPAB in Brisbane for the decade to 2009. There is finally a bit of news coming through radionz Pacific news programs especially. Until recently I lived 3 years in a CW comminity in Otaki NZ who also after a long court process were free when the National government here dropped their procecution of the Waihopi Three Ploughshares disarmers in the lead-up to the 2014 NZ Election – probably under the management of consent manufacturing PR advisors Crosby Textor. Incidentally for their modus operandi search . Nga mihi/solidarity and Merdeka/Freedom. …my last comment was meant to finish that for the modus operandi of Crosby Textor I searched . Also search Crosby Textor index in Nicky Hager’s “Hollow Men”. In an age of hyper-mediated politics creative, constructive, life-affirming non-violence and principled accountability must be more vital than ever to delegitimise organised political violence. The future of intelligence is civilocity, a neologism defined as a form of government where we get to watch the leader of our country for the entire time anybody ever leads our country. Imagine that intelligence community. Power to the people not genocide for the people!!! This is AWSOME!!! Ms. Needham, as someone who has done both, you see the value of and difference reporting and taking action. Without reporting/scouting of some sort, you would neither have known about that plane or how to take action against it. Without taking action, what good did the information do anyone? The two combined saved lives! so I hope you’ll appreciate a plan to do the same on today’s issues. As many like Occupy have pointed out, there is much wrong in today’s world. Solutions aren’t to be found in nearly as direct a manner. People think the issues are either too complex, like the economy or too overwhelming. In this they are partly right. Do you know anyone who has the time, money & energy to protest GMOs, police brutality, chem trails, mandatory vaccinations and bailouts out of existence? And then on their off weekend stop WWIII? Me neither. So I figured that something that could combine as many of these into one movement that required even less active participation from more of the general public could A) get around having to be at several rallies at once, B) make it easier to convince the reticent that there ARE problems, and C) make it difficult for those who cause the problems to explain them away one at a time. Actually, there is a LOT more to this idea than that. Many have mistaken it for “just another opinion” or “petition-based movement”. It is neither. It would just take too long to list all of the facets here. Please take a look at http://dissidentvoice.org/2015/07/a-single-change/ and the other posts above and below it at my website (links near bottom of page. Ask me question if this isn’t clear how it would be effective. Please. Dear Andrea I well remember your campaign and supported it by using my right as an R-R (inheritance) shareholder to confront their annual meeting with complicity in their providing Hawks with engines! I was delighted at the outcome of your trial which has surely set a legal precedent. As a member of CAAT and in view of the disappointing result of their recent court action against the Government, I have been thinking of the feasibility of similar action drawing attention to BAe’s massive involvement in provision of weapons to Saudi Arabia? ¿Puede ganar el movimiento por una educación gratuita, pública y de calidad en Chile?